Photo 1: Muscat, the capital of Oman (Source: bhart9070, Pixabay). Author: Dr. Mushtaque Ahmed is Associate Professor at the Department of Soils, Water and Agricultural Engineering of Sultan Qaboos University, Oman. He is a corporate member of the Institution of Engineers, Australia, and a member of the International Desalination Association (IDA). Reviewer: Dr. Jauad El Kharraz is Head of Research at the Middle East Desalination Research Center (MEDRC), Oman. He is member of Oman Water Society and Secretary General of Arab World Association of Young Scientists (ArabWAYS). He works on topics related to water management, desalination technologies, renewable energies and water-energy-food nexus among others. 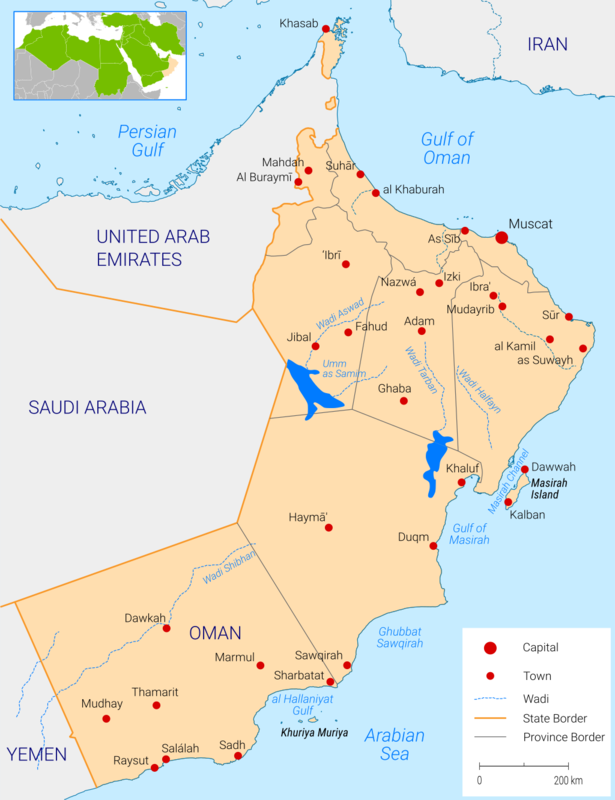 Oman, officially the Sultanate of Oman (Arabic: سلطنة عُمان‎ Salṭanat Uman), is an Arab country on the south-eastern coast of the Arabian Peninsula in Western Asia. Holding a strategically important position at the mouth of the Persian Gulf, the country shares land borders with the United Arab Emirates (UAE) to the north-west, Saudi Arabia to the west and Yemen to the south-west, and shares marine borders with Iran and Pakistan. The coast is formed by the Arabian Sea to the south-east and the Gulf of Oman on the north-east. The Madha and Musandam exclaves are surrounded by the UAE on their land borders, with the Strait of Hormuz (which it shares with Iran) and Gulf of Oman forming Musandam’s coastal boundaries. Oman’s total land area is 309,814 km2. Oman’s weather is characterized by limited and irregular rains, with an average of 100 mm per year. The potential evapotranspiration rate is high and variable but exceeds the precipitation rate by 20 times. This high evaporation rate is attributed to the high temperature associated with increasing humidity during the summer. Recent climate trends reveal a consistent increase in daily maximum and minimum temperature. Figure 1. Average rainfall (mm) in Oman. Figure 2. Average temperature (°C) in Oman. The recorded climatological data from a series of rainfall stations across Oman has shown variation related to altitude. The mean annual rainfall in these stations varies between the maximum in Jabal Shams (387 mm), which is the highest elevation (3,028 miles above mean sea level or AMSL), to the minimum (30 mm) in the low-lying desert plain at Fahud (170 m AMSL). Analysis of rainfall indicates two periods (Nov-Apr and May-Oct). The general climatic trend in Oman in the past few decades indicates decreasing rainfall with intermittent devastating cyclonic events, namely Gonu in 2007 and Phet in 2010. Map 1: Map of Oman. Some of the basic facts about Oman’s population, from the World Bank database, are given below. Population: 4.43 million (2016) (includes both Omanis and expatriates). Population growth rate: 5.2% annual change (2016). Life expectancy: 77.32 years (2015). Fertility rate: 2.71 births per woman (2015). These figures differ slightly from Omani governmental sources, which state that the population is 4.4 million and growing at a rate of 3% per annum. Muscat has the largest concentration of people (30%). A study conducted by the National Centre for Statistics and Information (NCSI) indicates that the population will increase by 2.4 million by the year 2040. • GDP per capita: $14,982.36 (2016). • GDP: $66.29 billion (2016). • GDP growth rate: 5.7% annual change (2015). • Gross national income (GNI) per capita: $41,320 purchasing power parity (PPP) (2015). Available at: https://data.gov.om/bixytwb/weather?regions=1000000-oman&indicators=1000100-average-rainfall. Accessed on: 4/4/2018. Available at: www.orangesmile.com/travelguide/oman/country-maps.htm. Accessed on: 6/4/2018. Available at: https://data.worldbank.org/country/Oman. Accessed on 6/4/2018. Available at: https://www.ncsi.gov.om/news/pages/newsct_20150727083324090.aspx. Accessed on: 11/4/2018. Available at: https://data.gov.om/OMPOP2016/population. Accessed on 4/4/2018.